A Bat in the Belfry by B.A. Ellis is a fascinating story, a true crime that will captivate readers as it captivated the world at the time the crimes were committed. Boston after the Civil War was a thriving city, but it had its own share of troubles and one of them was crime. Readers are introduced to a series of crimes committed by the Boston Belfry Murderer in the second half of the 19th century and how these crimes set the pulse of life in Boston at the time. Set against a fascinating historical and cultural background, this gripping story explores the drama surrounding the hunt for the killer, the trial, and the aftermath. The author takes readers through the tragic events that happened in Boston around this time, starting with the Great Fire that caused a lot of destruction in the city. Watch the painful drama as it unfolds through the eyes of witnesses and those involved in the story, including judges and other legal professionals. In his inimitable style and in a unique voice, B.A. Ellis makes an entertaining and a gripping offering that will arrest the attention of fans of true crime, lifting the veil from the mystery and giving them a complete and objective picture of the events surrounding the murders. Readers will enjoy meeting the characters, who are well-researched and masterfully crafted. This is one of the true crime stories that I found captivating, after Thomas Harris’s Hannibal. One has no doubt that the author did a great deal of research into the subject and has written a compelling account of the events, making pertinent historical references. A Bat in the Belfry is an enjoyable read, a unique story of events that terrorized Boston. A Bat In The Belfry by B.A. Ellis is a stunning historical novel depicting one of the greatest crimes and trials in the late nineteenth century. Fire ravages Boston in 1872, demolishing a large portion of the city. The following year another fire takes place and, in its aftermath, a couple discovers a man assaulting a young woman. The husband chases the attacker while the wife attends to the victim. However, they were too late; the young victim was already dead before the attacker had started to ravage her body. Thomas Piper, the second son of an affluent carpenter, resembles the description of the murderer and had access to the weapon and opportunity. Thomas is brought in for questioning, but although he is a good fit for the attacker, the police don't have enough evidence to arrest him. A couple of years later, a small girl goes missing after Sabbath School and is found up in the tower, fatally injured. As the church sexton, Thomas is the prime suspect in her death. He is placed on trial for her murder. Is Thomas Piper guilty of one or both deaths, or is he a victim of circumstance? Who knew that court proceedings could be so fascinating? A Bat In The Belfry by B.A. Ellis contains the riveting and wonderfully detailed account of the Thomas Piper trial. I was completely engrossed as I read through the trial and was intrigued with the author's impressions of the crime spree. Several horrendous crimes took place in Boston at that time, and the author posits that they may have something, or rather someone, in common. Interestingly, although the reprehensible acts were appalling, they were a catalyst for changing a few laws and regulations. It seems it even affected fashion. I thought it interesting that men stopped wearing cloaks at that time so they wouldn't be mistaken for the villain. The history behind the story is interesting and compelling. I thoroughly enjoyed reading it and highly recommend it to those who love to read court cases and historically accurate novels. This is one you won't want to miss! 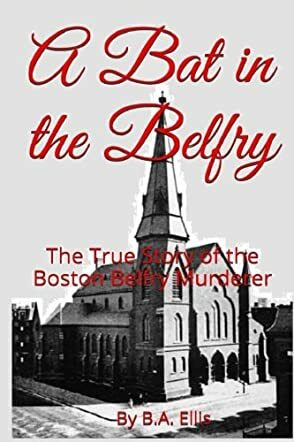 In A Bat in the Belfry: The True Story of the Boston Belfry Murderer, B.A. Ellis writes: “The Civil War ended a few years earlier. The Union recovered from the assassination of President Lincoln, although the wound would never fully heal. Life continued. Sons were lost. Memorials were raised, and Boston began to flourish. In the years following the Civil War, Boston became a city like that of London, Paris, and Berlin pertaining to culture, heritage, architecture, and affluence.” But while the city flourished, a series of tragedies befell her, including rapes, arson, and murders. Starting with the Great Fire of November 9, 1872, the author takes readers on a ride through the murders and the gritty investigation that was to hold everyone spellbound. With great clarity and using compelling prose, the author captures the story as it unfolded, with details that will surprise readers. A Bat in the Belfry: The True Story of the Boston Belfry Murderer is a story about one of the criminal minds that has shocked history, a story that is so well-written the reader will feel as if they are watching the events unfold before their gaze. B.A. Ellis does a great job with the research and readers feel it in the confidence with which he writes, the masterful presentation of facts, and the recreation of dialogues. The author notes that this work is the fruit of an investigation that involved the key players in the story — prosecutors, defense attorneys, and judges. B.A. Ellis has a unique gift for recreating history and writes in a unique, compelling voice that pulls the reader in irresistibly. The setting is beautifully captured and the historical references are accurate and a great addition to the entertainment the reader gets from this compelling work. This is a book that is every bit as entertaining as it is informative.